It is well known that plants photosynthesise in the presence of sunlight, consuming carbon dioxide, water and energy, and producing glucose and oxygen. The reverse reaction, respiration, goes on all the time, consuming glucose and oxygen, and providing the plant with energy, whilst releasing water and carbon dioxide. During the day, photosynthesis is dominant, so there is a net consumption of carbon dioxide. At night, photosynthesis stops but respiration continues, so there is a net release of oxygen. The compensation point is where the net change in oxygen is zero. The rate of respiration is fairly constant, while photosynthesis is light-dependent. Both processes increase with temperature, though photosynthesis slows down first when background temperatures get very high. This is a simple experiment to show that plants produce oxygen during the day and consume it at night. The apparatus is set up as shown in the diagram. The oxygen and temperature (and humidity) sensors are connected to the DrDAQ data logger, which is turn is plugged into the PC. The light sensor is on the DrDAQ, so that should be placed next to the experiment in full daylight by a window. A piece of turf is cut to fit the container. With about 2 cm of soil it will continue to grow well. This is put into the container and that put into the bag. A couple of sticks are inserted into the soil so they stand upright and the sensors are suspended above the grass and tied to the sticks. The bag is tied around the sensor cables, trying to minimise the air space so a larger difference in readings is obtained. The sensor cables are supported by a stand and clamp. The bag must be put next to a window as light levels quickly fall off going into a room. Human eyes are not very sensitive to changing light levels, so we don't register the large drop in light level going into a room away from a window. 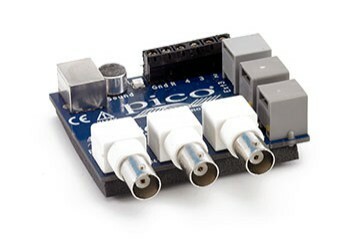 PicoLog is set to record at one sample per minute, with a maximum of 1440 samples (i.e. one day’s worth of data). The graph is set to show light, oxygen content, humidity and temperature, with the time scale set to ‘time of day’. The spreadsheet is set to show light, oxygen content, humidity and temperature. It is easier to view the spreadsheet if it is set to display every 20th or 30th reading once a lot have been taken (click 'option' in the side menu of the spreadsheet display). Once the experiment is set up, leave the sensors to log data for approximately one day. Ensure that the room is completely dark at night, and the computer screen is turned off. Where does photosynthesis take place in a plant? What does the plant use the glucose made in photosynthesis for? Name two factors other than light which are essential for photosynthesis. How are leaves adapted for photosynthesis? How will oxygen levels change in a wood or forest where trees are fully grown? How will carbon dioxide levels change in a wood or forest where trees are fully grown? Further study could involve carrying out this experiment at different temperatures or different seasons (length of day and intensity of light). Continuous daylight could be investigated using a light at night. Continuous night by excluding light from the plant and DrDAQ. Investigating optimal wavelengths of light using red, green and blue light bulbs or LEDs could form the basis of an interesting project. Specialist grow lights which emit the most suitable wavelengths for photosynthesis are widely available.